Calling to mind images of opulent nobility and royalty, the Gold and Burgundy Baroque Antoinette Dress is an absolutely beautiful renaissance-styled dress made from luxurious taffeta that features a number of elegant and attractive design elements. Made from gold and burgundy taffeta, this dress is extremely soft and agreeable to touch, it feels and behaves in a manner reminiscent of silk. The upper part of the dress is swathed in in burgundy taffeta that features a simple yet attractive gold-colored floral pattern, with only the central portion of the upper part of the dress revealing the dominant gold color. The embroidered burgundy decoration features ruffled burgundy trim and extends down over the wide hips of the skirt. The half-length sleeves are tied with ribbons just above the elbow and feature ruffled white trim as decoration. The skirt is predominantly gold in color. The upper part of the Gold and Burgundy Baroque Antoinette Dress is fully-lined and boned which not only helps the dress to keep the proper shape but also provides support and shape to your body when worn. It fastens via laces at the front and back of the dress, making it highly adjustable to fit your body-type. Featuring wide hips, the dress is pictured above with a pannier, if the pictured shape is desired then a pannier can be purchased separately. Otherwise the dress can be worn without one. The pictured hat is also not included with the dress. 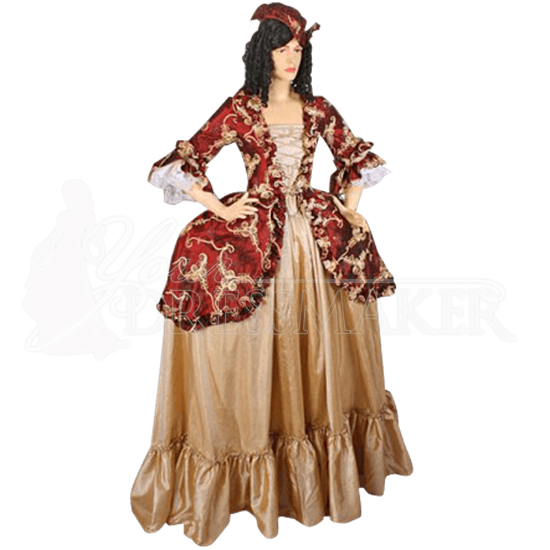 The Gold and Burgundy Baroque Antoinette Dress is a classic and beautiful renaissance-styled dress that is perfect for any woman who is looking for something to make her look regal and queenly.